AMC Theatres does not like MoviePass. The largest theater chain in the United States made that very clear when a press released indicated that the movie theater subscription service would not be welcome in their many locations after MoviePass dropped their monthly rate down to $9.95 for everyone, no matter where they lived or how many movies they saw. 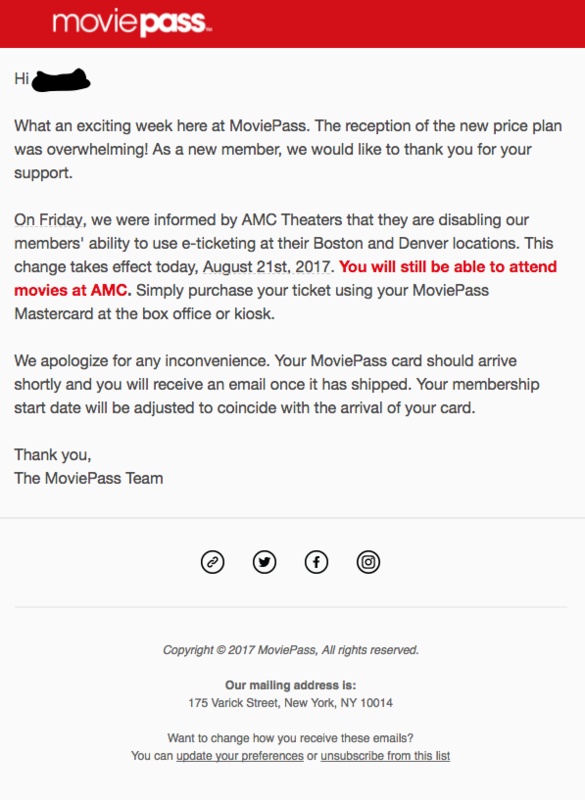 However, as we learned in the days following, the only way they could really block MoviePass from being used at AMC Theatres locations was to stop accepting MasterCard, since that’s the credit card company working with MoviePass to provide users with their membership card used to buy movie tickets. That doesn’t mean AMC Theatres won’t be petty about trying to make using the service a little more inconvenient at their locations. The movie theater chain has now blocked E-tickets from being purchased in advance of a screening at locations in Denver and Boston. But honestly, the blocking of MoviePass E-ticketing by AMC Theatres is just like throwing a pebble at a tidal wave. If you’re new to MoviePass or live in a location where E-tickets aren’t available, here’s how they work. The E-ticket system is a way for users to reserve their ticket at certain theaters ahead of time rather than being at the actual movie theater with your membership card to purchase the ticket just before to head into your screening. And that’s the feature that’s been disabled by AMC Theatres, according to an e-mail sent by MoviePass to a new customer in one of those areas. E-ticketing is a feature that’s only available at roughly 6% of the locations that support MoviePass, so you can see why this isn’t exactly a crushing blow to MoviePass or their users. It makes things a little more inconvenient for those fortunate enough to live in areas that have E-ticketing and need to reserve tickets and seats in advance due to large crowds, but it does not stop them from being able to use the MoviePass at AMC Theatres locations. The best work around for not being able to buy advance same-day tickets is to just head to the theaters earlier in the day before your show and buy tickets that way. Again, it’s inconvenient, but for MoviePass users who want to get the best bang for their buck, it’s a small price to pay to get the most out of an already cheap service. AMC Theatres is clearly not giving up without a fight when it comes to trying to stop MoviePass from becoming a big deal. Funnily enough, Boston and Denver were the locations where AMC Theatres and MoviePass were once testing a partnership that would have had subscribers pay a little extra for a subscription that included IMAX and 3D movies. There were even talks of an AMC exclusive card that wouldn’t require users to check in to a movie through the MoviePass app. That makes me wonder if the reason AMC Theatres is really upset about this is because they were getting their own subscription service together, just with a more expensive price tag that couldn’t compete with MoviePass’ new price. We are working as quickly as possible. So far, both their in-app customer support chat and customer service e-mail system has not responded to my needs at all, and I’ve heard from several colleagues and friends who use MoviePass that they’re having the same problems. This includes being reimbursed for tickets I had to buy myself due to the app not working, as well as being charged for my old $35.99 price along with the new $9.95 price point. Clearly MoviePass was not prepared for this high volume of interest in their service right off the bat, but the silver lining in all this the service is off to a good start when it comes to growing their customer base. It just needs to hire enough people to deal with all the new customers so they’re not turned off by how poor their customer service currently is. Hopefully all the kinks in the system will be ironed out soon.